Welcome, Eric! We're glad you're with us today. I’m a lifelong science fiction and fantasy reader but have always enjoyed those stories that show how the science and technology can affect people’s lives. By day I work in hi-tech, lecturing on telecom security (at the hardware level, not about the people who use phones to commit fraud). Over the years I have worked in a variety of fields supporting different companies via their data communications networks, starting in help desk and moving to designing multinational networks. As I have done quite a bit of travel for fun and business, I have included events in the story that are based on my own experiences. For example, several years ago I accompanied my wife to an International Scientific Congress in Montreal. That particular week had several major events going on in the city. Other than the congress, there was a week-long comedy street fair (Think jugglers, mimes, other performers, shows, and street art like a tree made out of circuit boards), and the North American Gay and Lesbian Choir competition. As you can see it was a very mixed crowd. Some of those events have been recreated in the story. The photo above is another example of my travels. In 2015 I was attending a telecom conference in Orlando, and I organized a field trip out to the Kennedy Space Center for 25 telecom geeks. One of the options was to take a simulator ride into space, but before you entered the simulator they took group photos that were cropped into space suits. Hence that photo. Another amusing part of that trip was that there was a local Star Wars fan group onsite with us. They had been part of a school outreach program and had some free time to wander the center. I also have a photo of me as a Jedi and a Stormtrooper in front of the original Gemini capsule. As mentioned in the acknowledgment section, I’m married to a wonderful (and tolerant) scientist who had two great children when we met. Now I’m the grandfather to her daughter’s son (Grandparenting is wonderful.) and he makes an appearance in the story, too (you can guess as whom). The year is 2152. 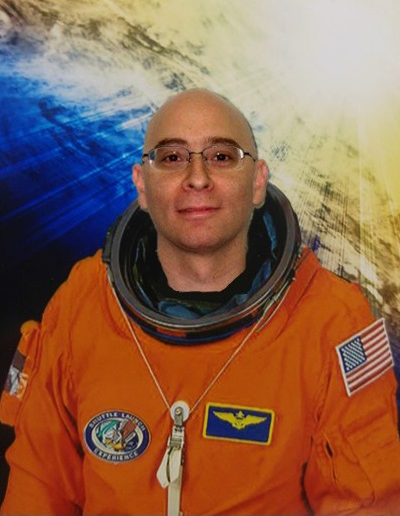 What started as a normal work day for BJ Armstrong (debugging the latest faulty AI), quickly turned to the adventure of a lifetime. Join Armstrong on his all-expenses-paid 30-day cruise through the solar system on board the maiden voyage of the latest pleasure ship (complete with a beauty pageant and scientific symposium), as he tries to unravel an assassination plot and foil the biggest heist in history. The only question that remains, will BJ get the girl? 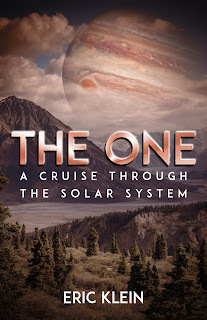 Today on #OurAuthorGang, author Eric Klein​ tells us a little about himself, talks about science fiction, and also gives us a teasing excerpt from his novel, "The One." Welcome, Eric. Your book looks very interesting. Looks like a very interesting novel. I love the book cover! This sounds like a very intriguing novel. Author Eric Klein visited #OurAuthorGang today and shared his new science fiction novel, The One - A Cruise Through the Solar System. Science fiction with a mystery? Ooooooohhhhh!!! Sounds good to me! Welcome to Our Author Gang, Eric! Thank you for sharing your book (adding to my ever-growing list of books). It's a pleasure to have you here today, Eric. Thanks for sharing your story. Welcome aboard, Eric! Glad you could make it here today. -- thanks for being our guest! Thanks for being with us today! Anxious to read The One! You have an amazing background, Eric! Your novel, The One sounds fascinating!